Given the remit, it would be easy to automatically equate ‘observe and report’ to ‘observe and criticize’ which in turn translates to “be picky’ rather than accept things at face value. But I was determined to remain objective. brand as we know it. At registration we were greeted warmly and served bacon butties and coffee which I have to say were really yummy! Tea in hand, we wandered offered to a photographic exhibition of Range/Land Rover vehicles in all kind of situations, terrain. As a photographer, I found the display quite interesting although not as interesting as the photographer himself who spent less time talking about the photos and more about himself. When we eventually managed to extricate ourselves from Mr Photographer and his tales of journeys around the globe, we drifted out into the court yard where we saw a small (hut based) butcher (yes, I know but I guess it follows the whole Range Rover, free range, farming theme). They were actually a really interesting bunch of people and they really appealed to me, even more so when they gave us a free goody bag to take home. simply had to walk to one of convoy or parked vehicles and select one. Thank God because it was starting to drizzle and it was freezing! By this time, some of the vehicles had left, including our so called ‘instructor’ not a good start. Not that we were going anywhere soon as the car in front of use (with two women inside it –gender not relevant but relevant to what I’m about to say) had trouble putting the car into drive (yes these were automatic cars) and just when we were about to get out were heard a voice over a walkie talkie strategically placed in one of the wells of our vehicle. Sarcastically, the tinny voice said “ladies, it helps if you put the car in drive”! Now, I’d normally find that quite funny (being a sarcastic person myself) but in this situation I actually thought it was outrageous! It’s his job to take care of people on this day not make fun of them! Another chalk on the black slate. Things weren’t going well. day out but if he’s bored then he really shouldn’t be heading up what is ultimately the experience of a lifetime for many drivers who pay a fortune for this experience. Anyway, we finally get into the thick of things and I’m ready for action. 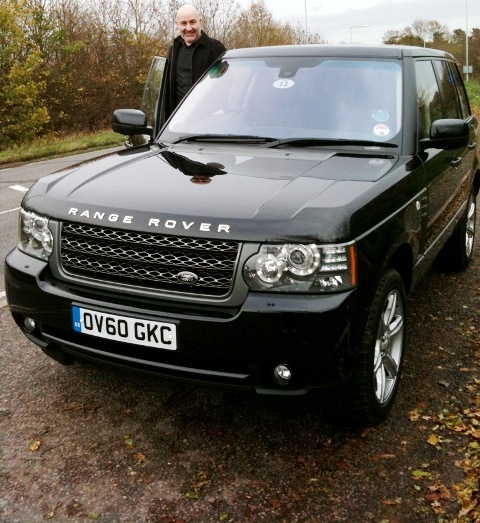 I’m ready to navigate bogs (of the mud variety), face certain death as I plunge down ravines and to stand idly by when I eventually need to be towed out of some trench, this is RANGE ROVER after all…. However, I’m not sure who exactly the experience was pitched at but well… if I said ‘tame’ would be an overstatement. The Ruts were shallow, the terrain average. Again, in comparison to others this was quite bland; it was just a nice drive around a field. Not something I’d expect from Range Rover. Come on guys! You’ve got a great machine/brand, what are you doing showing it off like this?! You just aren’t doing it justice. Why would I swap my car and invest a substantial amount of cash in this vehicle? If this event is pitched post sales then it’s even worse because it seemed disinterested ‘Now that we have your cash, we really don’t need to sell you the car’s abilities.’ I was actually quite relieved when this ended. I was looking forward to going back for tea! After tea, we drifted out into the courtyard once more where we found a graphologist (a person who can read hand writing). The setting for this was nice and cosy, amongst endless bottles of wine, lovely couches and chairs. Emma was a chatty character who absolutely ‘knew us’ so well just from a piece of hand writing! We and others, who were waiting with us, were impressed. I even heard people talking about her during lunch! Lunch was a refined affair. Clearly up one notch on your average luncheon. The surroundings were naturally very pleasant. My personal preference is not to share a table with many other strangers but I know this is part of the whole experience and encourages people to mingle. We did. Although we a lot to get through so we didn’t linger beyond eating lunch and running, so to speak. The lamb and the crumble were nice. I wouldn’t class it as a dining ‘experience’ but it was certainly nice enough and more than welcome. If I were to be super critical, I’d say that the cutlery had probably seen better days. Lunch aside, this will go down as one of the best experiences of the day. Now, the guy manning this section behaved exactly how I’d expect all of the Range Rover team to; he was warm and welcoming and managed to sustain the same smile for ALL of the people he came into contact with. Anyway, he led us to what have been £60,000 worth of vehicle and asked us to get into the driver and passenger seat. We thought he was going to join us but we were astounded when he said he wasn’t. We were going to take the car out on our own. What?! We could not believe it. He simply beamed a big smile and said, “No, you’re on your own. We trust you.” It was unreal. Two relatively young lads being given this £60,000 + vehicle and this major brand saying, “We trust you.” For us, it was serious Kudos to Range Rover for making this decision. It said, “We trust our vehicle to speak for itself” and it did. Brilliant! The car. The experience. I even have a souvenir picture to prove it! Eventually, we decided to drive the car back and then attend the ice road experience. More specifically, see how the vehicle performs on simulated icy conditions. It wasn’t very impressive though. Sadly, in comparison to other car makers, it left a lot to be desired. It was a fairly straightforward process of accelerating and breaking suddenly on artificial black ice. This, when compared to other events where you actually get to ‘drift’ with the car and experiment with high speed breaking was very poor. It did little to highlight the pros of ABS, and other automatic ‘self-correcting’ technologies I assume are on board a market leading vehicle such as the Range Rover. I guess we’ll never know. The experience was over fairly quickly and we were shuttled back directly to the ‘Range Rover Technology’ experience (at our request). And there are certainly some ‘impressive’ features on board the latest Range Rover, such as Radar Cruise Control, all round cameras and dual purpose TFT screen. Excellent and impressive technology presented by a clearly knowledgeable representative. Now he inspired us so much we wanted to get back behind the steering wheel of a car to try it out. So, we went back to our friendly Range Rover representative who handed the car over once more but only after explaining more about the new feature we were interested in ‘radar cruise control’. 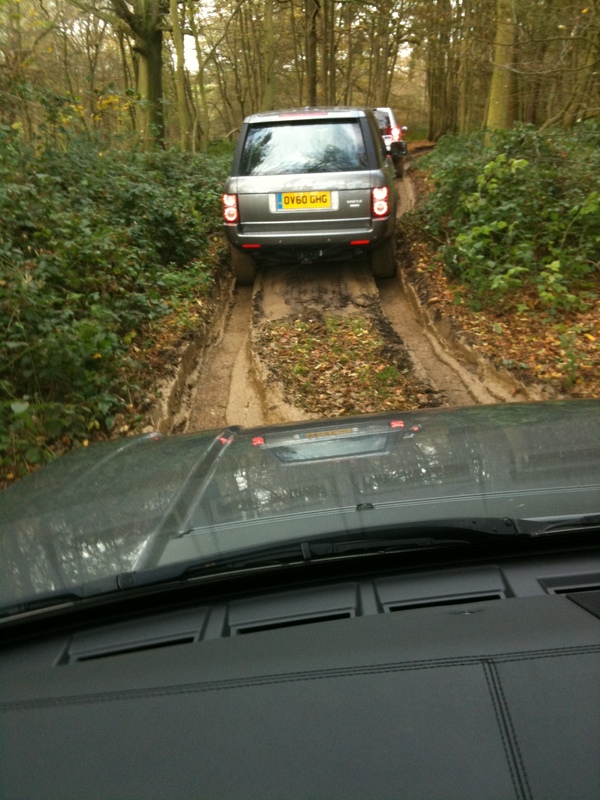 We were then off on the roads and in traffic where we put the car and the new feature through its paces. It performed beautifully both in and out of traffic, on and off the motorway, flawlessly impressing us each time. This, in our opinion, is what the Range Rover brand should be about. This car monitors the vehicles in front and is able to accelerate and stop in order to constantly maintain a safe distance between you and the car in front. How cool is that? And then…there it was, halogen lights burning under its makeshift white cover which, on cue, was pulled off to stunned silence. Well, all by me of course, I think I croaked “it’s my colour!” much to everybody’s amusement. 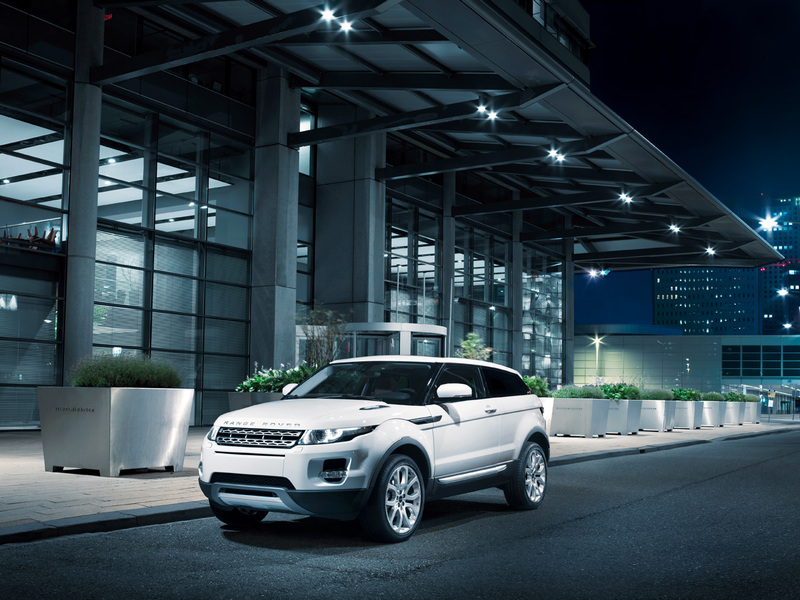 A RangeRover Evoque in the flesh (or in the metal). life. The engineers fussed around me (because it was just a model after all, doors might fall off an all that) but they were always helpful and clearly as passionate as me. Eventually, when they were able to extricate me from the car, it was over to the exterior designer. What a great way to spend the next 10 minutes but talking to him about the car I’ve been eagerly awaiting the release of for what seems to be a lifetime; the Range Rover Evoque. The model was a five door and not seen elsewhere in the UK apparently, hence the super secrecy and security detail. The car itself is everything I expected it to be. If the Evoque adopts much of the technology we witnessed today, it’s definitely going to be a new force to be reckoned with; it has the looks and the style, but will it have the brains and the ability? The key to its success will ultimately be the pitch to the rest of the world; too much ‘girly’ is going to turn it into an expensive version of the ‘hairdresser’s car’ and put off bachelors like me. Too rugged and it’s going to put off some of the everyday ‘girly’ girls. Whatever happens, there undoubtedly has to be two pitches; one for the coupe loving dynamos and the other for the family who want style and practicality. about 30 minutes and was quite interesting. I had to try really hard not to dominate the whole event. I think none of the people present (except for my hum) knew how much restraint I was showing! What we didn’t realise is that a bunch of Range Rover executives were listening to our every word via a close circuit television. We had been told that some executives were watching from another room but not that there were about 10 of them! So that was my Range Rover secret shopper day. Now all I need to do is write my report and look forward to the next event which I believe is going to be BROCHURES before they are released to the general public.